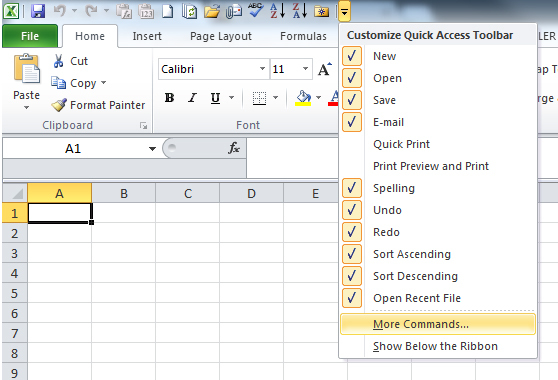 If there are actions you perform in Excel on a regular basis you can add them to you quick access toolbar, the QAT. The QAT is at the very top of the window and shows icons for each of your popular actions. As standard you will already have a few icons there but by clicking the little down arrow at the end of the QAT you can select some popular actions or click on ‘More Commands’ and add any from the list that pops up. The best bit about the QAT is that each icon is assigned a number. Pressing ALT and then the corresponding number performs that action. As you can see, it starts at ALT+1 for the very first icon and then counts up until ALT+9. After that it starts to count down from ALT+09.